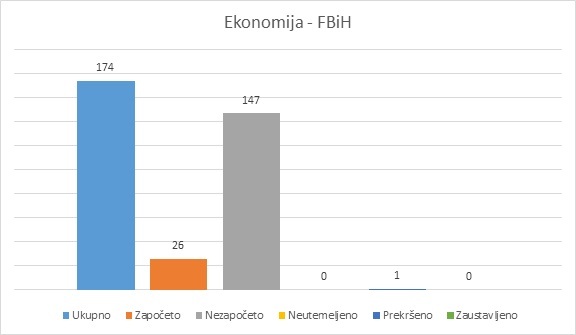 In the first 100 days of current term, the parties which, on March 31, have formed the Council of Ministers (SDA, HDZ, DF, PDP and SDS) and the Government of the Federation of Bosnia and Herzegovina (SDA, HDZ and DF), have begun workin on 51 out of 703 promises given in their election platforms. A total of 645 promises remain untouched, two have been broken, and one is suspended. It’s impossible to track the state of fulfilment of four more promises, which are rated as “ungrounded”. Specifically, the FBiH Government has started to work on 36 out of 503 promises, while the work on 467 other has not yet begun. One promise was rated as broken and one more as suspended. 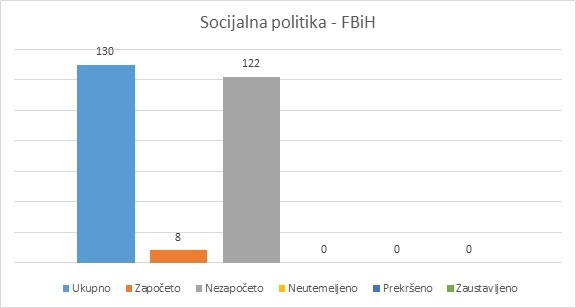 Taking into account that DF left the coalition on the entity level in the beginning of June, when the crisis of FBiH Government reached its peak, the promises of this party were only followed for a short period of two months. The largest number of promises was, as always, given thefield of economy (174 out of 503). This is also where most of the “initiated” promises are – 26 out of 36. Some of those are related to the adoption of medium-term strategy for agricultural development, which, if implemented will certainly have a positive impact on the fulfillment of many other promises made in the area of agriculture. On the other hand, among the initiated promises there are those which have been repeated for years, such as the SDA’s promise of an urgent adoption of the Law on Forests. 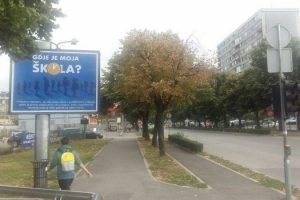 One broken promise in this area concerns the adoption of the Law on Petroleum Products (also made by the SDA), which was broken when the FBiH Government recently decided that this law is not necessary. The second largest is the area of social policy, where there were 130 promises, out of which only 8 was rated as “initiated”. Even in such a small number of promises, it’s hard to find any significant new policies or ideas. 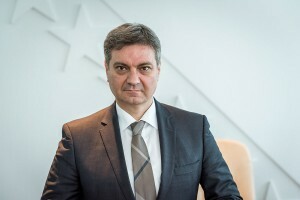 In this area, HDZ initiated the implementation of its promise to “revise the revision” of veterans’ protection, which has been undertaken in the previous term, while SDA’s initiated promises mainly relate to continuation of funding for the Foundation for Housing for Veterans and enabling returnees to RS to have access to health insurance. 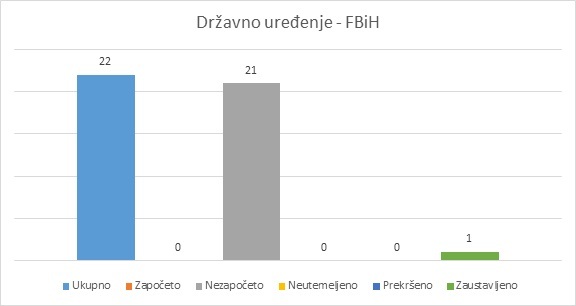 The FBiH Government has the weakest results in the areas of public administration, health and the rule of law. None of the promises in these fields have yet been initiated. In the area of state administration, the DF’s promise on de-politicization and changing employment policies in state-owned companies has been started and then suspended. This particular issue was the reason for the coalition to split, and the government to collapse before even reaching a full 100 days of work. 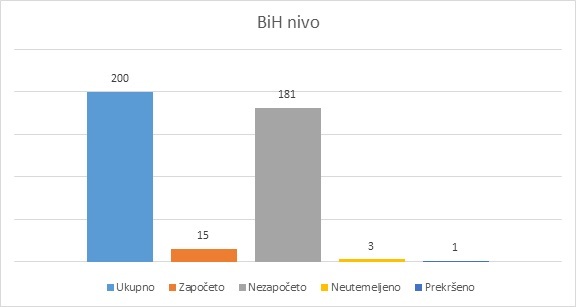 The Council of Ministers of BiH has a slightly better result, as they’ve started to work on 15 out of 200 promises. Most promises at this level have been made in the field of foreign policy (48) and the state administration (46), followed by the economy and education with 40 promises, the rule of law with 18 and the area of social policy (7) and health care (one promise). In the field of foreign policy, 3 out of 48 promises have been worked on, while in the area of state administration two promises have been initiated. One of these is DF’s promise which was initiated by introducing a new system of internal controls in state institutions in accordance with EU regulations, which will, if implemented, lead to more transparent handling of public finances. A small number of initiated promises in this area comes from the fact that most of the promises in this area relate to the constitutional reforms, which the Council of Ministers has not yet addressed in this term. This is also one of the few areas where the parties from Republika Srpska made promises related to the state level of government, but none of them have yet been initiated. In the area of the rule of law, there were 18 promises in total, out of which only two are rated as “initiated”, and they relate to the adoption of the Strategy for Fighting Corruption 2015-2019 and its Action Plan. It is interesting that, in this area, the Council of Ministers has been working on some issues and made positive decisions which are, however, not related to any specific promises given by any of the parties in power. 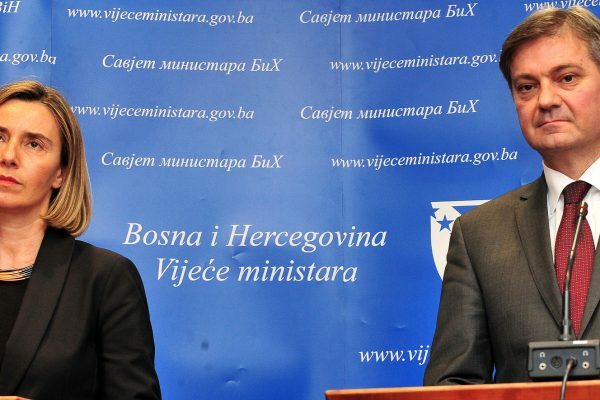 One of the most important of these decisions is the work on the Draft Law on Amendments to the Criminal Code of Bosnia and Herzegovina, with the aim to harmonize criminal legislation in BiH with international law and compliance with the recommendations of GRECO, MONEYVAL Committee and the FATF, the international body with the task is to monitor measures for combating money laundering and terrorist financing. Although it is undoubtedly a good move of the Council and the Parliamentary Assembly, the parties participating in the Council of Ministers didn’t have promises concerning this issue. Overall, we can say that the work of the FBiH Government reflects poor relations among the coalition partners. The paradox of the current situation lays also in the fact that the same parties still cooperate on the state level, even though they weren’t able to sustain their coalition on the entity level for longer than 60 days.